The genesis of today's Ballard Food Bank is a story of our community's response to growing needs of our less fortunate neighbors. It is the history of three local services organizations growing and merging. Established by Winnie Young and incorporated in 1982, WORK originally intended to provide job referral information about employment opportunities. However, they soon learned that other emergency needs needed to be addressed. WORK administered many job referral programs including "Ballard Clean Streets" program supervised by WORK and funded by Ballard merchants. Ballard WORK operated out of 1103-B NW Market Street until in moved into the former NW YMCA facility (1708 NW Market) in 1985. In the early 1980's, Randi Hansen and other community leaders established a fund through Ballard First Lutheran Church to assist person with critical needs. This effort, called North End Emergency Fund (NEEF), received continuing financial support from several north Seattle churches. From 1985 through 1988 NEEF continued under the auspices of Ballard First Lutheran Church but was administered by Winnie Young from the Ballard WORK facility. In 1988 the entire program was incorporated as North End Emergency Fund, a 501 (C)(3) corporation, and remained at 1707 NW Market Street, the former home of NW YMCA. In March 1992, the program leased its facility at 7005 24th Ave NW. The Northwest YMCA established the Ballard Food Bank (BFB) sometime in the late 1970's. Operating originally out of the NW YMCA office, BFB established new quarters at the Philadelphia Church Youth Building sometime in the early 1980's. In approximately 1985, when the NW YMCA closed its Ballard office, the food bank was in jeopardy. At that time the North End Emergency Fund (NEEF) agreed to provide operational support and keep the food bank open. In 1988, the Ballard Food Bank became a legal entity of North End Emergency Fund. In 1992, NEEF and BFB moved. In the mid 1990's Ballard Food Bank assumed responsibility for the Magnolia community as well as the Ballard community. In an effort to give more clarity to the services provided, the corporation's name was changed to North End Emergency Fund and Ballard Magnolia Food Bank in 2001. In 2002, due to ongoing identity confusion, the Board of Directors voted to revise the name of the agency from "North End Emergency Fund and Ballard Magnolia Food Bank" to "Ballard Food Bank". The name change did not involve any other changes in the Articles of Incorporation, By Laws, nor the service programs offered to our constituency. 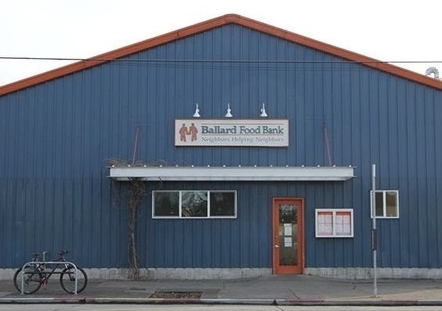 In 2010, the Ballard Food Bank moved to its current location in the “big blue building” on Leary Ave thanks to the generous support and efforts of the community.